Rapid Foundation Repair is your trusted contractor for foundation repair in South Dakota, Wyoming, and Nebraska. Unfortunately, foundation failure can strike anyone at any time. Your home relies on your foundation, so if your foundation is failing, the rest of your home is bound to have problems, too. How is Foundation Failure Caused? 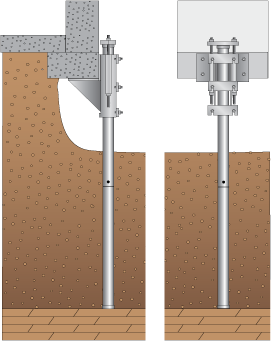 Foundation failure can be a construction issue, such as poor soil compaction before the foundation was laid. This means that the soil will compact itself under the weight of your home, making the foundation fall. It may also be the result of moisture issues, such as water pooling around the base of your foundation or excess water causing the soil outside your walls to expand. Whatever the cause, the symptoms of foundation failure are relatively easy to spot. Basement Wall Cracks: Any cracks, horizontal or vertical, are dangerous and will only grow over time. Leaning Chimney: A leaning chimney needs to be stabilized as quickly as possible. Stoop and Porch Problems: A sinking stoop may be the result of foundation problems in your home. Wet Basements: Wall and foundation cracks allow moisture and water into your home, providing a great environment for mold growth. Leaning or Bowing Walls: Leaning or bowing walls are very dangerous, as they can collapse at any time. These walls are often accompanied by horizontal cracks. Garage Column Cracks: Garage column cracks indicate a sinking foundation in your garage. These cracks should be fixed immediately, especially if the columns are supporting the rest of the structure. 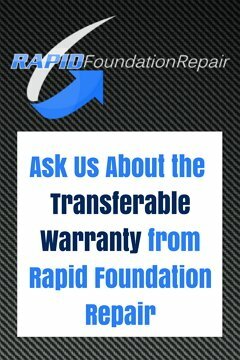 Rapid Foundation Repair offers multiple solutions for foundation repair in South Dakota, Wyoming, and Nebraska. At Rapid Foundation Repair, our well-trained staff has the experience necessary to correctly repair your foundation failure. .
No matter what the problem is with your foundation, basement, or crawlspace, Rapid Foundation Repair offers a solution to fit your needs. Rapid Foundation Repair offers tieback and anchor installation to correct bowing and leaning walls. Helical tiebacks are metal rods that are screwed in on a diagonal plane through your wall and into the soil outside. A wall plate is attached to the end of the rod. These tiebacks straighten your bowing walls over time and can also evenly distribute the weight of the soil outside to prevent future bowing or leaning. Whatever problem you may be experiencing with your foundation, trust Rapid Foundation Repair as your contractor for foundation repair.